Don't you hate making back to school copies? Depending on the system at your school, you might need to wait to be given a copy code before you can make these copies. And then, once you finally have your copies ready to be made, there is a line at the machine. Save yourself this trouble by making your beginning of the year copies at the end of the school year! Likely, you already know what you like to use those first few days, so why not use up your copies now and save yourself the hassle later? 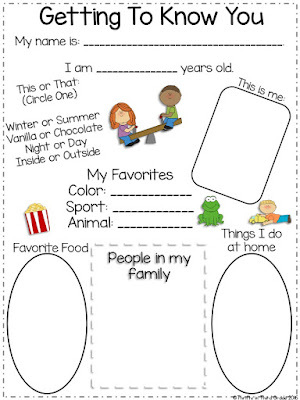 You can also make copies for meet the teacher/or open house. Here's a freebie for you. Go ahead and get it copied now! Laminate! Is there anything that you know will need laminating at the beginning of the year? Avoid lines at the laminating machine by getting some things taken care of now. One thing I always do is make privacy folders for my students. I glue two file folders together and then run them through the laminator. This makes for a great privacy shield for my students to use while they are taking tests, or when they just want a little help concentrating. You might consider laminating any posters, name tags, badges, folders, or other things you know you will be using. Supplies: Take inventory of what supplies you have left over and make a list of what you'll be needing. Since a lot of teachers (unfortunately) have to purchase their own supplies, it will help you later on in the summer if you know exactly what you need and what you have enough of. If you have a few boxes of pencils still, go ahead and get those sharpened now! You know you will need them, so if you are fortunate enough to have any leftover at the end of the year, go ahead and get them sharpened. You'll have more important things to be doing later. 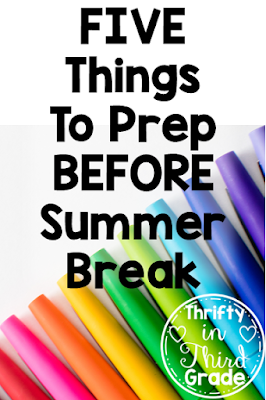 I hope these tips save you some time at the beginning of the year! I started making my copies for next year already. Now for my least favorite part... decluttering. I enjoyed your blog.